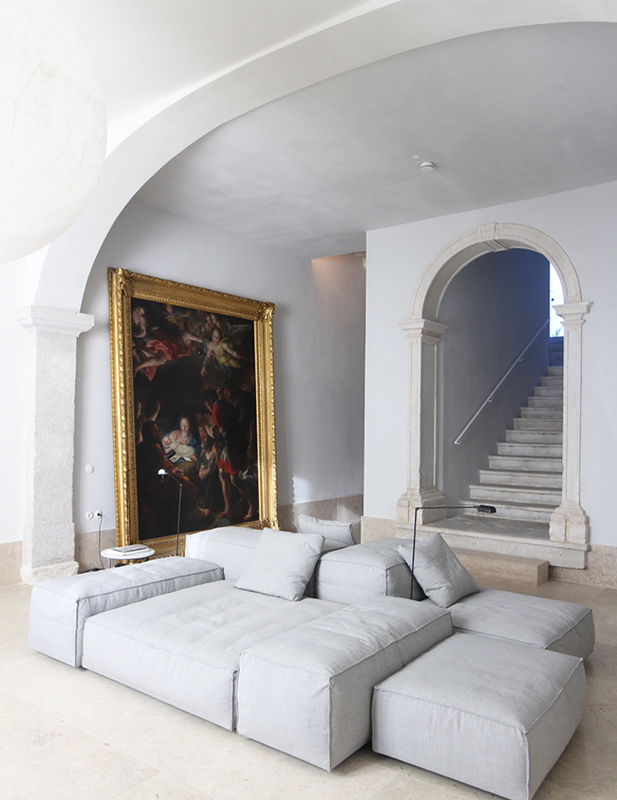 In Lisbon, a peaceful, minimalist palace that houses a family, a creative studio, guest rooms… and dreams. A NAME AND a date: 1728. Not too long before 1755, the fateful year of the earthquake that brought Lisbon to its knees. In other words, this palace facing the white domes and towers of the Pantheon and Saint Vincent Monastery has had a long and dramatic history. Its owner, João Rodrigues, likes to look for omens, and eight is his talismanic number. So when he found this date inscribed on a window frame during the building’s restoration, he saw it as a good sign. For him, eight is the number of creation, of infinity—endless, like his dreams. He had already made a name for himself with his Casas na Areia (“houses in the sand”) and water- front Cabanas no Rio in Comporta, and his Casa no Tempo in the Alentejo hills. A hotelier and a pilot for the Portuguese national airline TAP, Rodrigues is above all a man of taste. 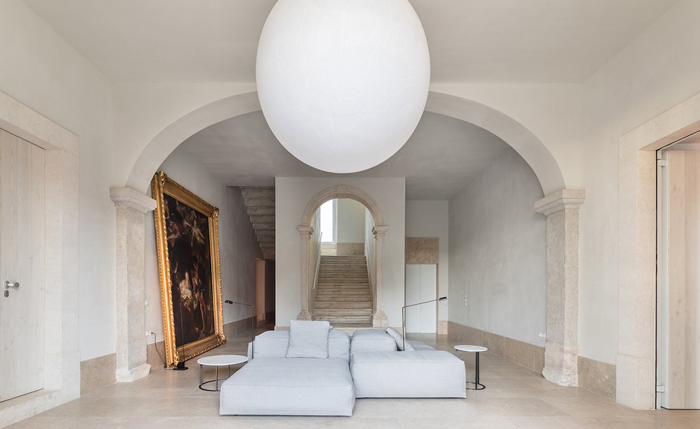 His latest project, Santa Clara 1728, is a tour de force —the majesty of the 18th century tempered with Scandinavian simplicity. Working with the architect Manuel Aires Mateus, Rodrigues first planned to con- vert the entire building into a design hotel. 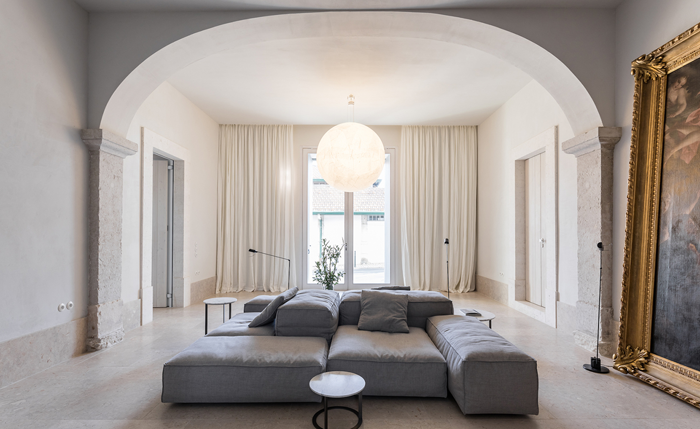 But one day his four children began asking, “When can we move into our new home?” He hadn’t thought of living there.himself, but he talked it over with his wife Andreia, and a decision was made: the family took over the newly added top floor of the palace. 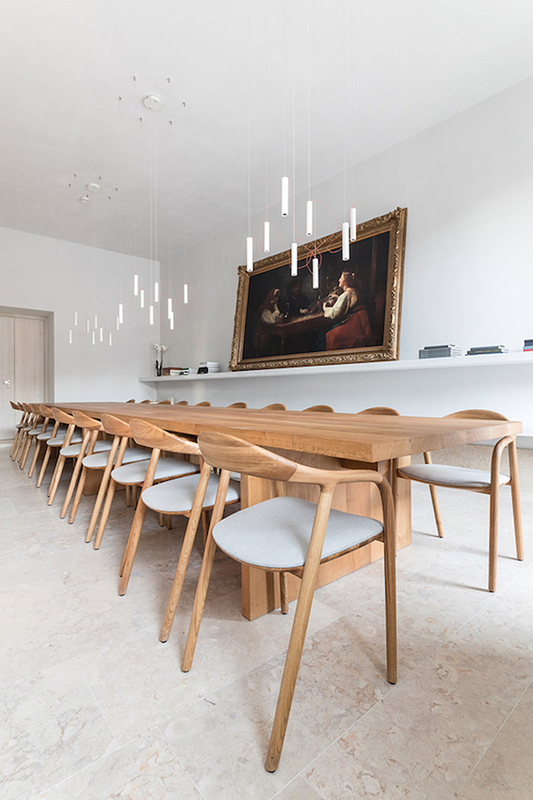 The rest of Santa Clara 1728 houses six rooms for guests, the owners’ offices on the ground floor and a dining room whose long table, with room for 20 diners, makes it a convivial space for sharing and celebrations. 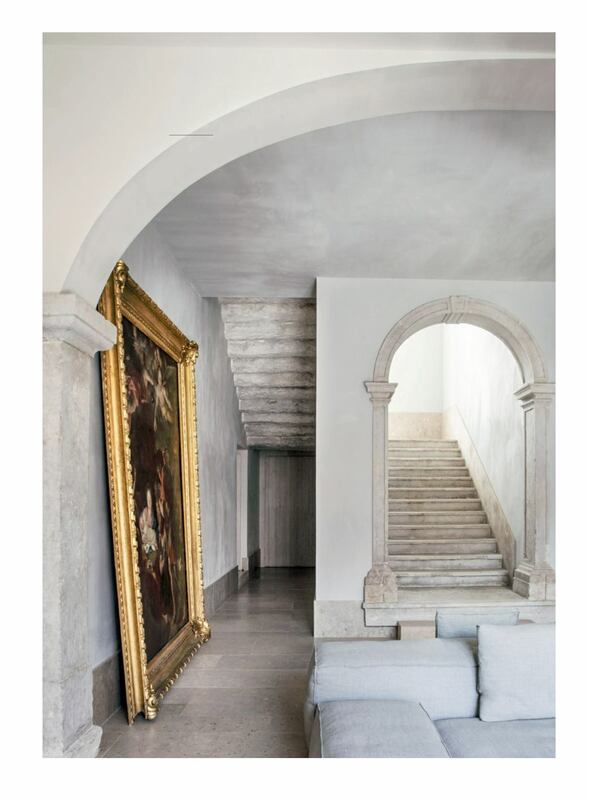 The décor is an ode to minimalism, devoid of orna- mentation save two immense 18th-century paintings in gilded wooden frames: a nativity in the monumental entrance hall and a secular scene of card players in the dining room. 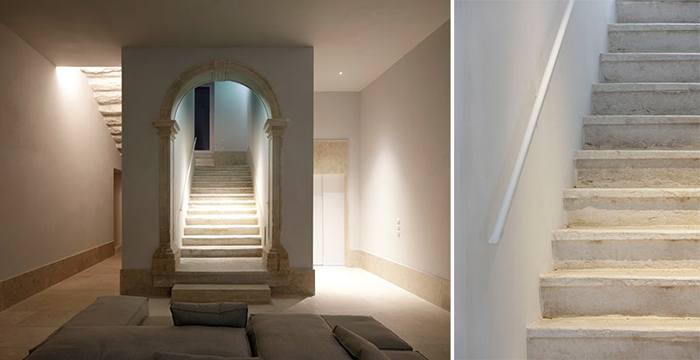 Otherwise, the interiors are dominated by white Lioz, the emblematic stone of Lisbon, from the magnificent staircase and towering vaults of the entry- way to the surprisingly spacious bathrooms. The sinks and bathtubs are also carved from this nearly lumines- cent limestone. It took ten days of work to hollow out each 350-kilogram (770-pound) tub, and a crane to lift them all into place. In this white, immaculate environ- ment, the visitor is immersed in serene quiet—another facet of João Rodrigues’s vision. He calls it “silent liv- ing.” An incitation to contemplation.